Jude Winchester has asked to be placed on the transfer list at Cliftonville. The former Kilmarnock midfielder, 22, still has another year to run on a two-year deal but manager Tommy Breslin and the club have agreed to his request. The ex-Linfield player, who first joined the Reds on loan from Kilmarnock in January 2014, scored the only goal in the County Antrim Shield final win over Bangor this season. James Knowles and Martin Murray have, however, agreed new terms at Solitude. Former Blackburn Rovers player Knowles, currently in his second spell with the Reds after spending the 2013/14 season with Linfield, originally joined the club in the summer of 2012. 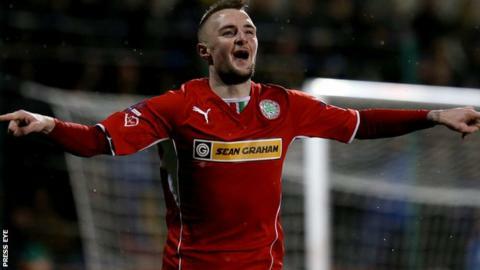 He has scored eight goals in 58 appearances, helping Cliftonville to the Irish Premiership title, a County Antrim Shield and a brace of League Cup honours. Murray has won the same haul following his arrival from Glentoran two years ago, since when he has netted nine times in 55 outings.